Fixes PerMa's Sacrificial Casting ability so that shouts don't trigger the health drain. Makes it take other cost reduction boni into account when calculating health cost. Sacrificial Casting and associated abilities are now available for Vampire Lords (who gain a significant cost reduction when using it). T3nd0 for Perkus Maximus - it's pretty good! -- Version 3 increases spell magnitude by 10% when sacrificial casting is active. Also increases more if caster possesses Lifelink and Flesh to Power perks. Fixes PerMa's Sacrificial Casting ability so that shouts don't trigger the health drain. **For some reason Whirlwind Sprint still kills you though. Makes it take other cost reduction boni into account when calculating health cost. 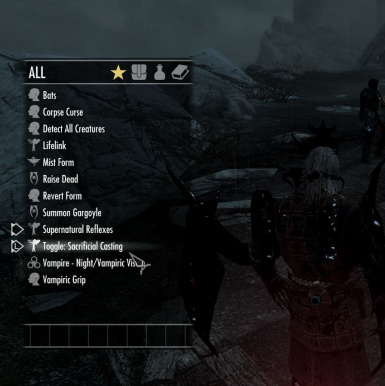 Makes Sacrificial Casting and associated abilities available for Vampire Lords. Vampire Lords using sacrificial casting have an additional 15% reduction to the health cost of the spell. 1. Unequip shouts and turn off Sacrificial Casting if you have it on. Save. 3. Sacrificial Casting needs to be cast once in normal form before it will appear in the Vampire Lord spell list.